Song birds need homes, food and water like everyone else. Song birds have to eat and drink too and they need a place to raise their young. Flowers alone are often not enough to keep these birds around. They may come to your garden to collect supplies for their nests or to hunt for bugs, but they must eventually leave to look for water or to find a place to nest. Why should it be this way? I know I'm happier if everything I need to live is within five minutes of my home. It takes less energy to get there, that is gas for us and flying time for them. That also translates into less bird time for you. You can, however, remedy this problem. Most song birds will use a nesting box or bird house to raise their young. Provide this and they won't need to fly back and forth from your garden to their nest. For seed eaters, provide feeders and a variety of seed. All song birds eat different things. Some will eat the bugs from your garden, others eat thistle, and still other will eat sunflower seed. Then of course you've got your suet eaters and your fruit eaters. Look for the proper for the birds you'ld like to attract. Putting fruit out in your new rain garden will lure in still more. Learn which birds eat which . Be sure and add a birdbath for drinks and play. Birds have to drink just like you. Learn the secrets of attracting wild birds and discover the joy of bird watching in your own backyard. Do you want to hear and see the song birds that will soon be visiting your new rain garden? All About Birds is a wonderful site, that provides information for everything you need to know about song birds. It includes attracting them with feeders, nesting boxes, nest material as well as what to do with an injured bird. This site also includes volunteer oppurtunities for those interested in helping to protect rare and endangered birds. 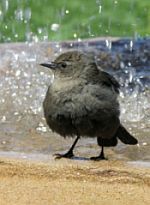 Check out Bird Baths and Beyondand A Bird's Home for more on attracting birds.